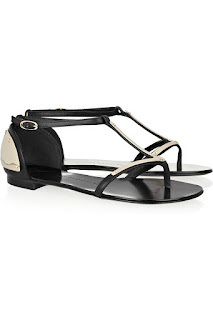 Giuseppe Zanotti's metal plated t-strap sandal retailed for $750 at Net-A-Porter but are sold out. If you love the look but don't have that kind of cash lying around (even if they were in stock), check out this option from Zigi Girl at Nordstrom. They retail for $38.90 (on sale!!) and come in three other colors. Click on the image below for more information or to purchase.